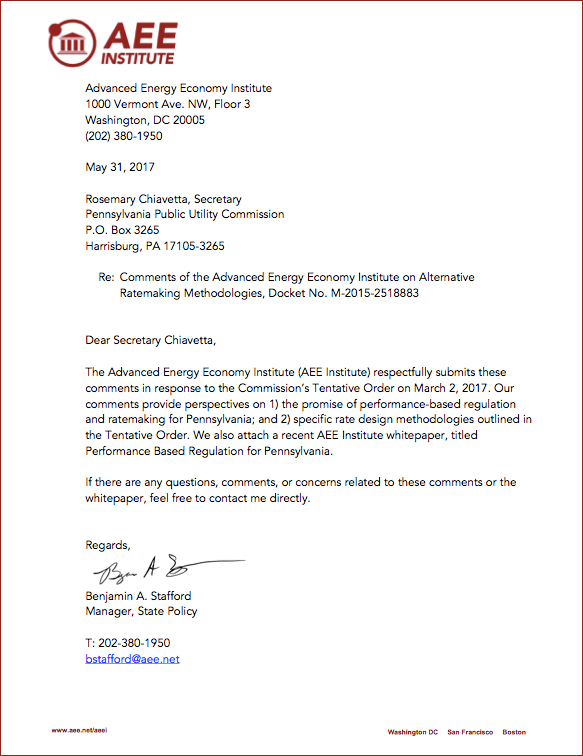 Comments submitted by AEE Institute on behalf of AEE and its member companies in response to the Pennsylvania Utilities Commission's Tentative Order, issued on March 2, 2017, seeking input on alternative ratemaking methodologies. In these comments, we provide our recommendations for Pennsylvania to pursue performance based regulation (PBR), and provide our perspective on specific rate design methodologies mentioned in the Tentative Order. Our ratemaking commentary builds on our experience in other states, while keeping in mind the unique characteristics of Pennsylvania. Fill out the form to download the comment letter.